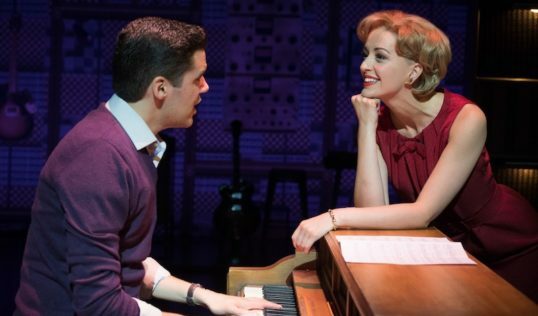 Beautiful, the musical life story of a pop legend Carole King makes for perfect entertainment at the Playhouse all week until Saturday. It Might as Well Rain Until September. Some Kind of Wonderful. Will You Love Me Tomorrow. The Locomotion. You've Got a Friend. A battery of brilliant songs which could be strung together into a pretty decent jukebox musical. Beautiful delivers a lot more than that by presenting them as part of the life story of the woman who wrote or co-wrote them, Carole King. Before she was Carole King, singer-songwriter, she was Carol Klein from Brooklyn, a 16-year-old sharp enough to have skipped two grades whose divorcee mother dreamed she'd become a teacher ("Girls don't write music, they teach it"). Carole has other ideas, hawking her songs at 1650 Broadway, which houses songwriters by the score, writing hits to order. She sells a song to producer and talent manager Donnie Kirshner, but it's pretty much a fluke – she has the melodies, but the words don't come easily. Enter Gerry Goffin, fellow student, aspiring playwright and, it turns out, complementary lyricist. Before long they're writing partners and in love. An unplanned pregnancy leads to a speedy, but sincere, marriage proposal and when hits such as Take Good Care of My Baby and It Might as Well Rain Until September follow, the future looks bright. They have space at Kirshner's office next to another pair of talents, Cynthia Weil and Barry Mann, and a friendly rivalry is born. Who'll get to number one in the Billboard charts first? Who'll get the best act to sing their material? But beyond the rivalry is that friendship, and it's this that forms the heart of Beautiful. Smart, confident Carole. Highly strung Gerry. Hilarious hypochondriac Barry. Wildly witty Cynthia. They're a dynamite quartet, superbly written by Douglas McGrath – Barry and Cynthia could have walked off the set of a screwball comedy but they're far from caricatures. All the lead parts are convincingly sketched human beings, with the details filled in by the actors. Bronté Barbé is wonderful as Carole King, showing us her many colours, from cocky kid to disappointed wife to triumphant solo artist. She never undersells King's talent but when the second act sees Barbé combine a tougher side with the earlier tenderness, Carole King unleashed is something to behold. Barbé's acting is never less than excellent and usually it's more. As for her singing, it's a bewitching homage to one of the greatest voices of the 20th century. Kane Oliver Parry manages to keep Goffin sympathetic even in his lowest moments, having made us like him so much in the early part of the show. He's a very masculine presence, but never overly macho – it's easy to believe this guy wants to touch people with his words in three-minute pop songs. As for Amy Ellen Richardson and Matthew Gonsalves as Cynthia and Barry, they're a magical match. I wouldn't want more of them in the show – this is King's story, after all – but could we have a spin-off please? Their comic timing, their solo singing and duets… Richardson and Gonsalves are gifts to this production. Beautiful is chock-full of gorgeous musical set pieces, with standouts being 1650 Broadway Medley, a collection of songs that shows the breadth of talent in Kirshman's building; King's heartbreaking It's Too Late; and a spine-tinglingly lovely, no-doubt-fictional first airing of You've Got a Friend that makes perfect theatrical sense. Original director Marc Bruni and touring directors Ed Goggin and Alastair Knights have produced a cracking piece of theatre, mixing character, incident and song to compelling effect. The Fifties and Sixties wardrobe put together by Alejo Vietti has me itching to get to the nearest vintage emporium, while the set design of Derek McLane switches between glum and glam in an instant. Steve Sidwell's music arrangements are deliciously translated by the band led by musical director Patrick Hurley, who expertly plays keyboards for cast members from the pit thanks to a handy hidden camera above the on-stage piano. There isn't a weak link in this production. It's only on until Saturday – if you've not got a ticket, let's hope it's not too late, baby. Running time: Two hours and 40 minutes (including one interval). Edinburgh Playhouse, 18 – 22 Greenside Place, EH1 3AA. Evenings: 7.30pm; Matinees: Wed, Thurs, Sat: 2.30pm. You are subscribed to email updates from All Edinburgh Theatre.com.